Having taken a look at the UK Finance (formerly the ABFA statistics) stats to the end of Q2 2018, there are a few trends that are worth noting. Overall members had made £21.4 billion of advances, the majority of that will be accounts receivable financing, with some £4.3 billion being ABL (Asset Based Lending) style facilities. The average advance per client has now increased to almost £531K, although client sizes range from those turning over less than £500K pa, up to those transacting hundreds of millions each year. The first trend is that there appears to be a shift in the client book away from smaller clients towards larger clients turning over millions, tens of millions, or even hundreds of millions each year. The statistics to the end of Q2 2018 showed reductions in the numbers of smaller clients (when compared with the same quarter the previous year) with a -1.6% decrease in the number of clients turnover over less than £500K per annum, and a -1.9% decrease in the clients turnover over between 500K and £1m pa. Despite this trend, those two categories i.e. clients turning over less than £1m pa, still account for almost 45% of total clients numbers, nearly half. There have been increased numbers in all the client size bands from £1m pa, upwards through to over £100m pa, with the growth in the number of clients turning over more than £100m pa showing a +9.7% increase. Despite this increase, those larger businesses still only account for just over 1% of the overall number of clients serviced by the asset based finance sector. The concern for any funder is that the failure to collect out for any one of those huge companies creates a potentially business threatening situation for the financier. This shift is consistent with the stance taken by some providers to move away from the servicing of smaller clients in pursuit of larger lending. 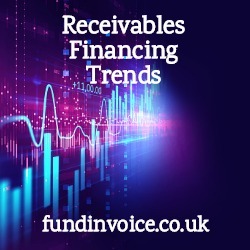 At FundInvoice have maintained a panel of funding partners (both inside and outside of the UK Finance membership) that will fund at all levels, even new startups. However any movement away from such a core market as the small business sector is a concerning trend, when providing access to funding is such a hot topic. The figures also show some product movements. In a year on year comparison of sales by product, there was a -26.9% reduction in the volume of non recourse transacted. This are bad debt protected transactions, a worrying trend when so much uncertainty remains around Brexit and high street retailers. Should there be further insolvencies, such as we saw with Carillion, there may well be clients that rue the decision not to opt for a non recourse facility, which would have provided bad debt protection. The figures also show increases in the volume of sales funded in both the construction sector (+8.3%) and the retail sector (+6.1%). Both sectors are now serviced by an increasing number of providers, whereas they were taboo when I first started in the accounts receivable finance industry, some 30 years ago. The rise of companies willing to fund against applications for payment, within the construction sector, and those willing to provide a merchant cash advance to the retail sector is clearly driving this growth. Focusing on these new sectors has been driven, to an extent by the broadly static number of clients serviced by ABFA members overall, in recent years. This is likely to be driving them to seek new markets that were previously not considered so attractive.